Welcome to one of the best kept secrets of Africa! Botswana is considered to be one of the largest wildlife areas in the world due to its dedication to the preservation of its extraordinary natural resources. 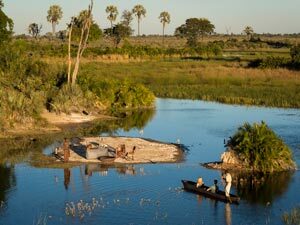 The Okavango Delta is quite unique and a priceless treasure. Source of life for hundreds of animal species, it is a fabulous natural labyrinth, which you will have the privilege of traveling through aboard a traditional canoe (mokoro) , on foot, on elephant back , on horseback or by 4×4 . 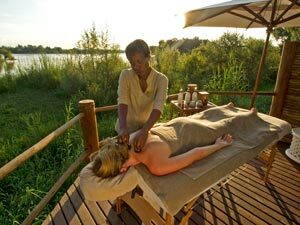 For the fortunate, it offers exceptional conditions of comfort in the heart of an incomparable natural heritage which adds to the magical experience that Botswana is. Discover the true meaning of relaxation in a sanctuary of calm right in the heart of the wilds. Picture the scene: you’re lying under the trees overlooking a lagoon, surrounded by lush vegetation. As background music; the drone of dragonflies and the occasional grunt of a hippo. Your highly qualified therapist applies fragrant massage oils made from indigenous plants to your body and her skilled hands carry you away to a nether state. After a cool, refreshing drink you’ll leave feeling rejuvenated and revitalized, ready for your next safari. 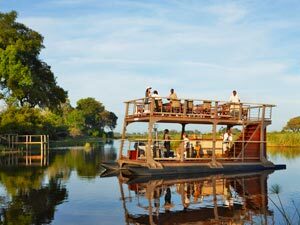 The Okavango Delta transcends all of “Mother Nature’s” rules by creating an Eden of lush greenery in the very centre of the burned Kalahari Desert. This is a horse lovers’ playground where you can safely follow in the footsteps of missionaries and explorers of old times, led by experienced guides who will share their intimate knowledge of the desert and the delta with you. 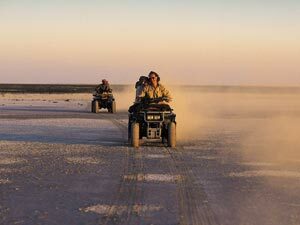 You’ll learn how the waters brought by the Kalahari sands bring life to the delta and how the vast grassy areas merge with the crystalline water, attracting large herds of wild animals. 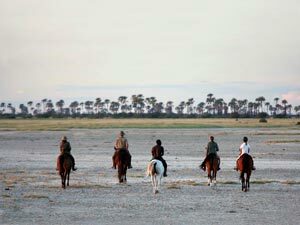 Your horseback safari will enable you to discover isolated, unspoilt areas that are difficult to access otherwise, making this adventure a truly rare and privileged moment. Glide slowly through this water maze of breath-taking beauty on a mokoro (dugout canoe) The Okavango Delta is an aqueous paradise of lilies, reeds, papyrus and green water palm trees… As the sun begins to set, your poler will embark upon a tiny virgin island and serve Gin & Tonics as you listen to the sounds of the animals and birds getting ready for the night.